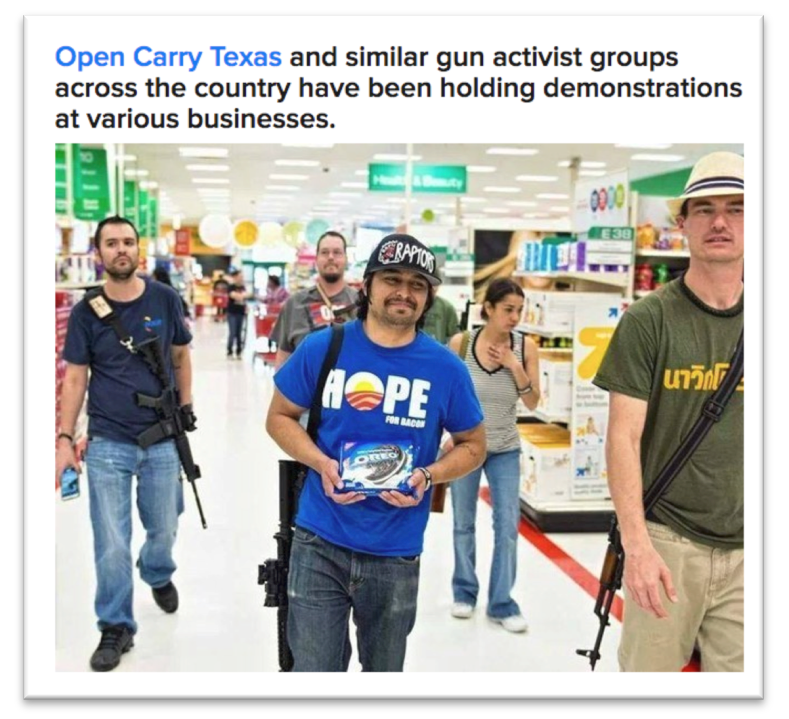 White men go shopping with their guns and express their rights; black men get assaulted carrying a permitted firearm because they are seen as criminals. Racial profiling is highly evident when we look at the experience of people of different races carrying weapons in public. “A surveillance video from a Walmart located near Tampa shows 62-year-old Clarence Daniels trying to enter the store to purchase some coffee creamer for his wife this past Tuesday. 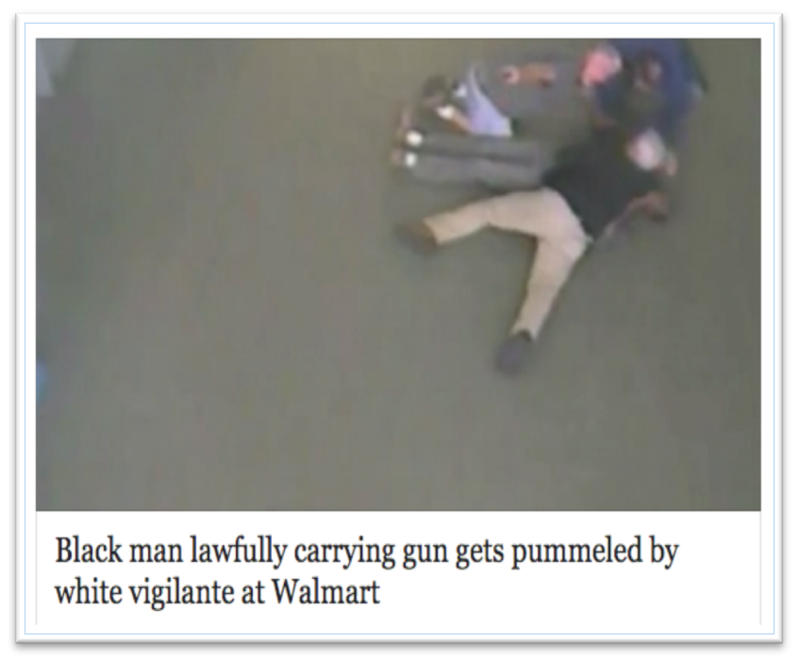 He barely steps through the automatic doors before he is pummeled by shopper Michael Foster, a 43-year-old white man. According to local news reports, Foster originally spotted Daniels in the store’s parking lot placing his legally owned handgun underneath his coat. In keeping with Florida’s well-known vigilante spirit, Foster decided to take matters into his own hands by following Daniels into the Walmart. Without warning, he tackled Daniels and placed him in a chokehold. Police soon arrived and confirmed Daniels indeed had a permit for the handgun. Take the skin-tone Implicit Association Test here. “The IAT measures the strength of associations between concepts (e.g., black people, gay people) and evaluations (e.g., good, bad) or stereotypes (e.g., athletic, clumsy). The main idea is that making a response is easier when closely related items share the same response key. When doing an IAT you are asked to quickly sort words into that are on the left and right hand side of the computer screen by pressing the “e” key if the word belongs to the category on the left and the “i” key if the word belongs to the category on the right. The IAT has five main parts. In the first part of the IAT you sort words relating to the concepts (e.g., fat people, thin people) into categories. So if the category “Fat People” was on the left, and a picture of a heavy person appeared on the screen, you would press the “e” key.